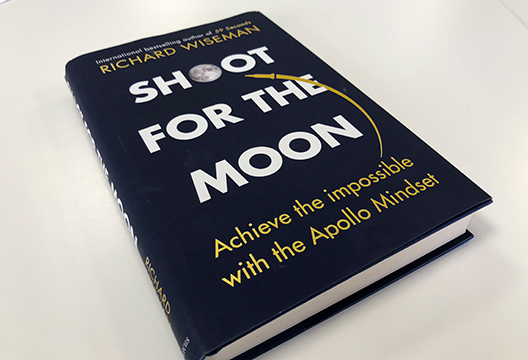 Professor Richard Wiseman's new book, 'Shoot for the Moon' considers how we can 'Achieve the Impossible with the Apollo Mindset'. Our editor Jon Sutton posed him some questions, and we publish an extract. July 20th, 1969: Neil Armstrong becomes the first person to walk on the Moon. We all recognise this to be one of mankind’s greatest achievements. Yet what did it take to make John F. Kennedy’s dream a reality? In his new book Richard Wiseman – Professor of the Public Understanding of Psychology at the University of Hertfordshire – presents a pioneering study of the mindset that took humanity to the Moon, and shows how you can harness and use it to achieve the extraordinary in your everyday life. Our editor Jon Sutton asked him some questions. To me, it feels like the moon landing would be even more ‘impossible’ to do now than 50 years ago. Do you agree, and if so what might that say about our world or collective psyche? I think that's right. It was an amazing moment in history because America suddenly came together and was united behind a common cause. Kennedy really fired people up with a vision that enthused and energised people. Could it happen today? I think so, but we need charismatic leaders, to start thinking about society more than self, and an audacious aim. You make the point that the effort was at least in part born out of a climate of fear. Is our current sense of fear driving a new ‘moon shot’, and if not why not? Part of the fear surrounding Apollo came from the West being scared that the Soviets would beat them to the Moon, and that this would threaten the future of the world. And remember, this was in the late 1950s and so relatively soon after the Second World War. I get the impression that everyone felt that it was up to them to step up to the mark and do their bit for a greater good. What role would you have played in the effort? Hummm.... well, not an astronaut, that's for sure. They were fearless and prepared to put their lives on the line. And I don't have the focus to be a Mission Controller. Maybe I would work as a CAPCOM – these were the people on the ground who spoke directly to the astronauts in space. They had to be able to express themselves in a very simple and succinct way, and I think my equanimous, didactic, and not-at-all platitudinous approach to matters of monstrous magnitude would mean that I am well-suited to the position. Not tomorrow, no. I have an appointment with my barber. However, in general, yes. I think it would be amazing to see the Earth from a new perspective. That's what the astronauts tended to talk about when they returned, and that's one of the major achievements of the missions. As the old adage goes, we had to go to the Moon to discover ourselves. You quote Bill Tindall Jr – 'I never thought we were working at all... It was just so much fun.' Can there still be practical messages for workplaces where that might feel like more of a stretch? I think the fun they were having was due to them all being passionate about the goal and finding it so meaningful. In the book I talk about research that involves people reflecting on their work and asking themselves 'Who benefits from this?'. For instance, if you are working on a supermarket checkout, you might be the only human contact that some of your customers have all day. When you realise that, the job becomes far more meaningful. What’s your current ‘stretch goal’, or a time in your life when you thought 'Go big or go home'? Actually, choosing to study psychology when I was a teenager. At the time I was studying maths, physics and chemistry, and psychology was nowhere near as popular as it is today. Lots of people advised me against it and it involved learning an entirely new skill set. It was tricky early on but I just got my head down and kept going, and luckily it turned out for the best. Of the principles you identify in the book, which is the one you identify most with? Probably the notion of being highly flexible. I change my mind all of the time. Even putting together this book was a bit like that. It was an unusual book to write because it has both a strong narrative arc – the Moon landings – and a strong self-development message plus exercises. I am not sure that has been combined before and I struggled at the start to find the right format. There are around ten different versions of the first chapter on my computer, each one with a different structure. But in my experience, if you keep working away and keep open to new approaches, you get there in the end. It's really easy to get stuck on one way of thinking and that can kill a project. You identified the importance of competition (with the Russians). Do you feel you have competitors or rivals in psychology, or someone you envy? Not really. In fact, quite the opposite. Early on in my career I carried out lots of work into the psychology of magic and am delighted that lots of people are building on that now. It's the same with the books. When I started there weren't many experimental psychologists doing books with a self-development component, and now quite a few people are doing it. To me, that's great because it means that the area will change and grow. In the book I recommend a fun sense of rivalry but certainly not envy because that can just eat you up. You mentioned the importance of ‘defensive pessimism’. I think that’s me. Good thing or not? Psychologists frequently promote the upside of optimism, but sometimes ignoring possible problems becomes an issue. Defensive pessimists tend to think about the bad things that might happen, and then think about how they will cope if they run into these problems. Under certain circumstances, it is a healthy thinking style and was certainly used during the Apollo landings. They invested huge amounts of time and energy thinking about what they would do if they encountered a problem, and it was crucial to the success of the entire enterprise. So, in general, I am a fan, providing it doesn't get out of hand. You mention Ted Sorensen’s advice to express ‘big thoughts in small phrases’. Does that drive your approach to writing? You make it look effortless, and I particularly admire the way you regularly identify and summarise the key principles. That's very kind – you should see the huge pile of screwed up balls of paper in the corner of my office every time I try to write something! I tend to spend a bit of time thinking about the point that I am trying to get across, and then quickly write something. I often learn most from writing, and so when I put finger to keypad I realise whether it feels right or whether I am driving into treacle. If it does feel ok, I then try to re-write it in about half the number of words. It's amazing what you can take out from an initial draft and still say the same thing. Then I put away the text and don't look at it until the following morning. Then I will try a second trim. It's all about trying to say the maximum amount in the most elegant, but hopefully breezy, way possible. What’s it like writing about psychology in the midst of our ‘replication crisis’? Do you feel you can ‘trust’ the kind of ‘neat’ findings that make for a good narrative? It's fascinating. The replication crisis has shown that some findings are less robust than we initially imagined, and so it underlines the importance of writers presenting information in context, not over-claiming, and doing their best to reflect the current state of knowledge. - Shoot for the Moon: Achieve the Impossible with the Apollo Mindset is published by Quercus, and this extract is with their kind permission. Find much more from Richard in our archive. Before one of the later Apollo launches, astronaut Ken Mattingly spent a few nights going out to the launch pad and studying different parts of the rocket that he hoped would take him to the Moon. He often thought about the thousands of people involved in the design, fabrication and checking of each part of the Saturn V.
One night, Mattingly took the elevator to an upper level of the launch tower and found himself outside an open hatch. There, he climbed through and entered a large room packed with pipes, cables and wiring. A lone technician in the room recognized Mattingly and the two of them started to chat about the risks involved in the mission. During the conversation the technician explained that he no idea about how many parts of the rocket worked. For instance, he didn’t understand how the enormous amount of fuel created the force required to escape the Earth’s gravitational pull or how the navigational systems would guide it to the Moon. Understandably, Mattingly became somewhat concerned. However, the engineer then continued and explained that the panel in front of him was his responsibility. It was his job to fully understand the complex electronics inside that panel and ensure that they were in perfect working order. The engineer ended by assuring Mattingly that when it came to that panel, the project wouldn’t fail because of him. It was in that moment that Mattingly realized that the Apollo missions had been successful because so many of those involved in the project had exactly the same sense of personal responsibility. Pad leader Günter Wendt is another striking example of this ‘it won’t fail because of me’ attitude. Thin, bespectacled, German-born and with a fondness for bow ties, Wendt was one of Apollo’s best-loved and most eccentric characters. Wendt was in charge of the Saturn V White Room, the small area used by astronauts to make their final preparations before entering the spacecraft. It was Wendt’s job to ensure that the astronauts were safely buckled into their spacecraft, say a last goodbye and good luck and then seal the Command Module’s hatch. Wendt ruled the White Room with a pleasant smile and an iron fist. Nobody touched anything in the area without his permission and when one engineer went to make a change without Wendt’s consent, he called security and had the engineer removed. This attitude pervaded the whole of Mission Control. If someone said they were going to do something, they did it. They didn’t procrastinate, pass the buck, or cut corners. They were as conscientious as they were hard working, and their word was their bond. Follow the leader... but at what cost?